Commercial air travel is not a hassle-free proposition for anyone, but fountain pen fans face an addiitonal set of hoops to jump through. The same shifts in cabin air pressure that inflate your bag of chips at takeoff and implode your bottle of water at landing can create issues with the mix of air and ink in your fountain pen. 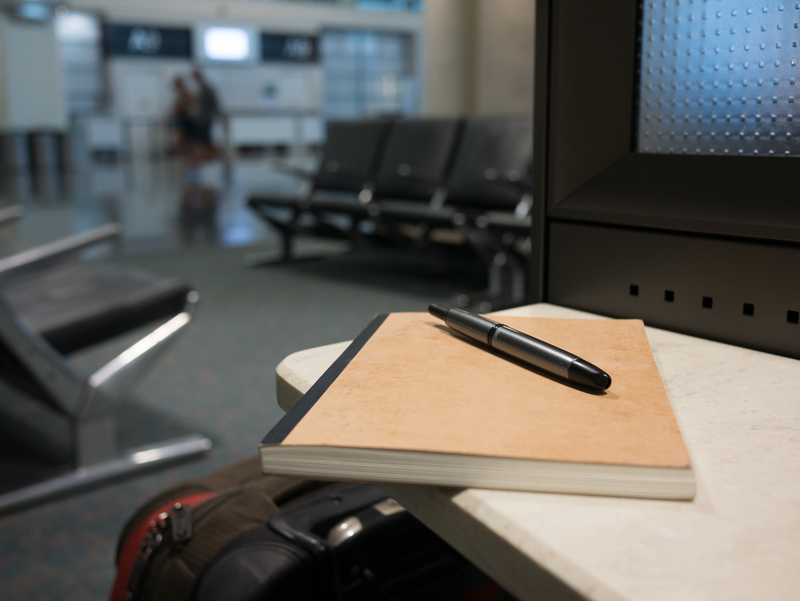 At the same time, many people do fly with inked fountain pens regularly without incident. I've been experimenting with different fountain pen travel approaches over the last year or so. Overall, it has gone well. I've never had a major in-flight ink catastrophe. The worst I've encountered is some minor leaking into the pen cap on a couple of occasions. While I'm not willing to simply go fountain pen free for a few days when I travel, I'm also not the type of person who needs a full arsenal on the road. If a trip is a week or less, I am fairly content having one fountain pen with me (preferably, a favorite) and a few gel pens as backup. Pilot Vanishing Point with CON-50 converter fully inked with Pilot Iroshizuku Shin-kai. One ink sample vial filled with some extra Shin-kai. It's one of my favorite pens overall, so I don't feel like I'm settling while I'm on the road. It's proven itself (mostly) trouble-free on past flights. While it's not necessarily compact, it is pocketable. Its unique refilling approach provides great flexibility. A common tip for flying with a fountain pen is to either fill the pen up fully or travel with a very low ink level. Either avoids having a sizable amount of air and ink fighting over the same space in the pen. I started off thinking that ink catridges would be easier to manage on the road, but cartridges offer little ability to manage ink level. It's easy enough to start off with a full cartridge when you leave home, but it's hard to time the return trip. You could certainly just click in a new cartridge for the trip home even if you haven't yet spent your original. But this is a bit wasteful, particularly if your trip has multiple legs to it. Prior to my most recent trip, I had a bit of an "ah-ha moment" when I realized that the Vanishing Point's unique refilling approach would make it pretty easy to refill on the go directly from a small ink sample vial. This seems pretty obvious in retrospect, but it never occurred to me until last week. So rather than flushing my pen and switching from converter to cartridge before my trip, as I've done in the past, I just refilled the converter with the same Shin-kai I was using. Then, I used an eye dropper to put some spare Shin-kai into an empty ink sample vial. Avoiding a pre-trip ink change was kind of a big deal for me. I always seem to find myself packing for trips at the last minute, so anything I can do to simplify is a big win. In addition, the converter and ink sample vial combo makes it possible for me to top off my ink before the return flight. I just did this at the hotel the night before my return trip, but it's easy enough that I would even consider trying it while killing time at the airport. Lastly, because the sample vial is small and made of plastic, I can just drop it my plastic "liquids" bag and avoid both security checkpoint issues and broken glass in transit. Another frequent fountain pen travel tip is to keep your fountain pen nib pointing up during take-off and landing. This ensures that if there is ever any competition for space between ink and air inside of the pen, the air (and not the ink) is the first to go. I've never had an issue with in-flight leaking when I've remembered to keep my nib up. My only leaks were in situations when I forgot and left my pen in my pants pocket or bag. I have easy access to my pen at all times. My nib will automatically be facing up during my flight without me having to think about it. By storing the pen in a consistent and visible way each time, I'll be much less likely to lose it and quicker to notice if I ever do leave it somewhere. I can bring one of my nicer pens without worrying about it banging around with other items in my pants pocket. Writing with fountain pens during a flight is another topic of debate. There are some who feel that writing with a fountain pen in flight increases the odds of some kind of ink burp. While I don't use my pen during ascent and descent, I do use mine regularly while at cruising altitude. I haven't encountered any issues to date. On the flip side, I have enjoyed many hours of uninterrupted writing enjoyment. For me, the pros outweigh the potential risks. I include a bulb syringe in my travel kit hoping that I'll never need to use it. It's small and lightweight enough that there is little downside in bringing it along. It will, however, be extremely handy should I ever need to perform an emergency pen flush in transit. The enjoyment I get out of having a nice fountain pen to use while I'm traveling outweighs the extra effort and minor risks involved. Now that I've found a simple, compromise-free travel kit and workflow, I feel like I can keep the risk of leaks to a minimum with only a few minutes of extra effort before each flight. Do you have any fountain pen travel tips (or battle scars) to share? I'd love to hear about them in the comments or on Twitter.